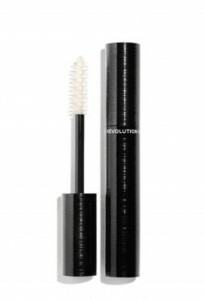 Chanel Mascara 3D Printing Wand – Gimmick or Gold? - 3D Prototype Design, Inc.
Home/Uncategorized/Chanel Mascara 3D Printing Wand – Gimmick or Gold? When we first saw the headline ‘Chanel, the first mascara brush printed on a 3-D Printer’, our minds flooded with questions. – what process did they use? – what part ‘exactly’ did they 3d print? – why did they decide to 3d print instead of traditional manufacturing methods? 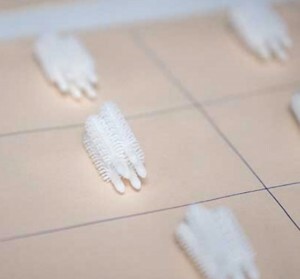 After some research, we dissected and discovered that Chanel has been developing a mascara applicator while using the benefits of the SLS (Selective Laser Sintering) 3D printing process and nylon the same way our very customers do! Since the combination of SLS and nylon material offers not only great detail parts, they also provide strength, durability and longevity, which lends itself incredibly well to final production parts. Their design process was the same as anyone else in manufacturing. It started with CAD design concept, 3d printing, testing, modifying the design and then repeated over and over until perfected. Chanel engineers created over 100 iterations before settling on the final part design. As we understand it, They are now manufacturing the brush and assembling it with the other components manufactured with more traditional means. As the brush can literally be made only with 3D printing (due to its complex design that prohibits traditional manufacturing methods), the added advantage of the SLS material’s surface finish to better hold and distribute mascara as well as the small size of the part, makes it very economical and effective to mass produce with 3d printing, and quickly! While the idea of using 3d printing to manufacture may be new to some, it’s not to us! 3D Prototype Design over the years has produced a multitude of end user products and components in batches from hundreds to thousands from items such as drones, office furniture, fishing lures and coffee makers, to lighting fixtures and virtual reality goggles, all with 3D printing (primarily SLS technology and nylon). Gimmick or Gold? If the design could have easily been created and manufactured more economically and accurately with traditional manufacturing, then we may have voted on the gimmick. As Chanel has taken advantage of all the unique benefits of SLS 3D printing… we say GOLD!